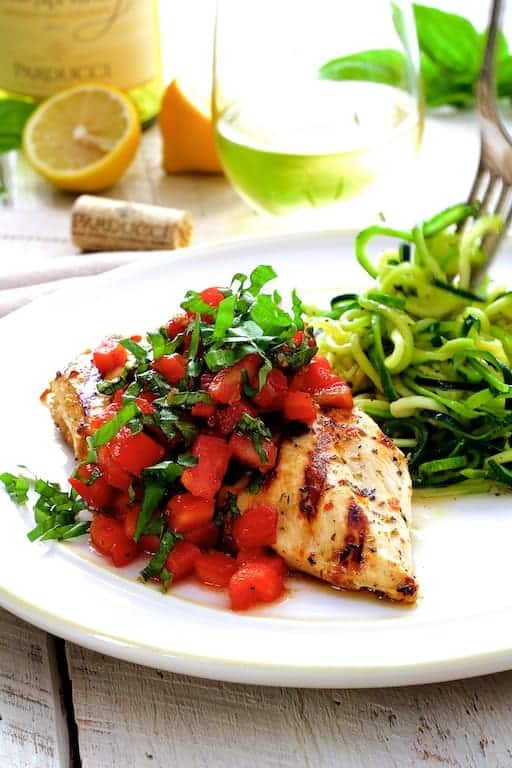 Italian-inspired Chicken Bruschetta with Zucchini Noodles is as light, fresh and easy as summer itself with fresh, vine-ripened tomatoes, sweet basil and zucchini. This dish is perfect for a wide range of diets including Paleo, gluten-free and low-carb. Is there anything better than a summer tomato? 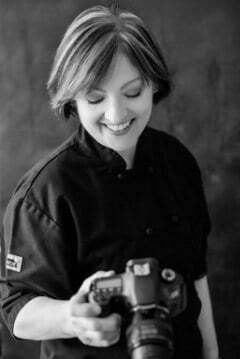 I could eat my weight in fresh tomatoes this time of year and love to find new and creative ways to use them. 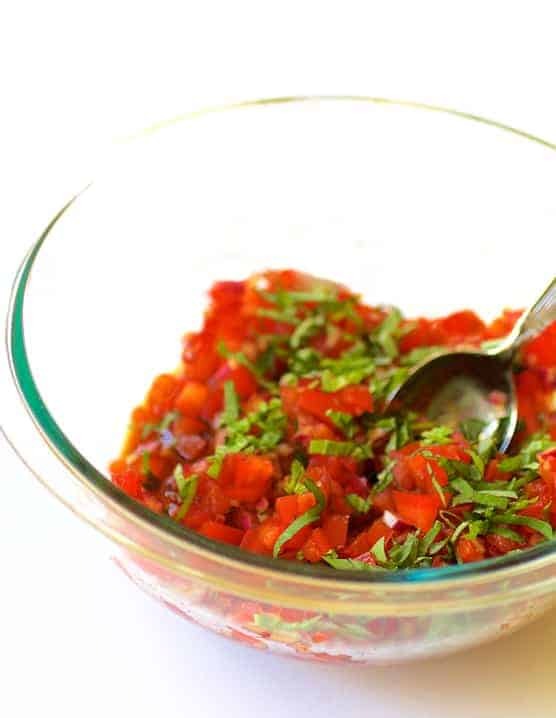 One of the most wonderful ways to enjoy a summer tomato bounty is bruschetta, the classic Italian starter typically made with fresh, diced tomatoes, basil, garlic and olive oil spooned onto grilled bread. Although not always used in bruschetta, I add a teaspoon or two of the best balsamic vinegar I have on hand. If you’re on a low-carb diet, following Paleo principles or require a gluten-free diet, this dish is for you! If you just want light, fresh and healthful, this dish is for you, too! 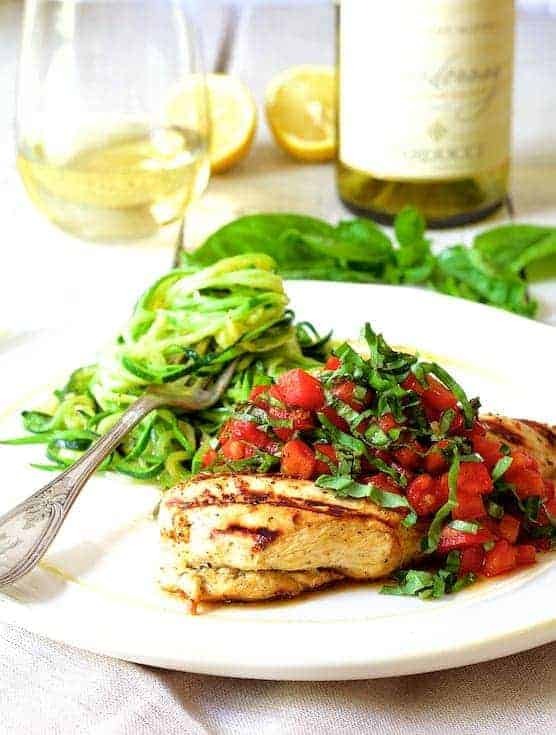 The flavorful classic bruschetta combination is served over chicken breasts that were marinated in a lively lemon, garlic and herb combination and then grilled. When marinating proteins, I do it in a zipper-top bag. The marinade surrounds the protein more evenly and cleanup is easier. Simply remove the protein from the bag and toss the bag and marinade away. Zucchini “noodles,” or “zoodles,” are perfect with the chicken. Spiralizers are super-hot gadgets right now and this trend shows no sign of letting up. 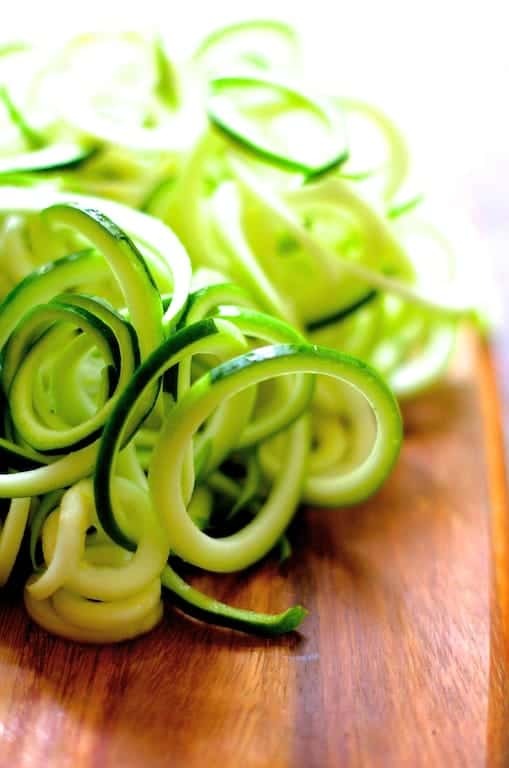 If you don’t wish to add another gadget to your kitchen, use a vegetable peeler to create thin “noodles.” If you’re good with a knife, slice the zucchini into planks then cut into thin noodle-like strands. Zoodles cook very quickly. Perfect when you don’t want to heat up your kitchen!